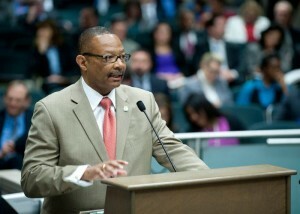 California online poker supporters now have a second bill to watch, as Assemblyman Reginald Jones-Sawyer (D-Los Angeles) has introduced another piece of legislation that would regulate the game in the Golden State. Sawyer’s bill, known as the Internet Poker Consumer Protection Act of 2015, joins one proposed by Assemblyman Mike Gatto (D-Glendale), which also goes by the same name. But despite the identical names, the two bills are quite different. The Jones-Sawyer bill diverts from Gatto’s legislation on two key points that are sure to be hotly debated during the upcoming legislative session. First, the new bill (AB 167) doesn’t have a bad actor clause, unlike Gatto’s bill (AB 9), which does. Gatto’s effort isn’t as harsh as some bills: there is a path even for those companies that operated illegally in the past to become eligible for licenses. But AB 167 doesn’t have any such ban on bad actors, allowing for regulators to judge each applicant themselves. The second major diversion from Gatto’s bill is the inclusion of the horse racing industry. Jones-Swayer’s bill would allow racetracks to own and operate online poker sites, making them eligible alongside card rooms and Native American tribal interests. This has been a long time dividing point in the California gaming industry: the tracks say they’ll fight a bill that doesn’t include them, while tribal groups say that casino-style games shouldn’t be expanded to the horse racing industry. Not surprisingly, the combination of these two factors has caused plenty of reaction from California gaming stakeholders, with some praising the bill and others blasting it. That’s a predictable action from PokerStars and their allies, which include three major poker rooms and two Indian tribes. The Amaya Gaming-owned company is the primary target of bad actor language in virtually any online poker bill. It’s just as predictable, then, that other interests in the state feel just as strongly that a bad actor clause is a necessary addition to any Internet poker bill. “We are disappointed that the bill disregards important principles from a broad coalition of respected tribes and card rooms that help prevent corporations and entities that previously violated federal law from profiting from tainted software, brands, and databases derived from illegal activity,” said Pechanga Tribal Chairman Mark Macarro in a statement. Macarro also expressed his tribe’s opposition to the inclusion of the horse racing industry in the online poker marketplace. “California voters have always had the final say on gaming expansion and they have already rejected expansion of gaming for horse racing,” he said. While the two bills have some major differences, however, Gatto says that he has met with Jones-Sawyer and believes they can still work together to get online poker up and running in California. “I left the meeting with Mr. Jones-Sawyer feeling very comfortable about his willingness to work together and the likelihood that eventually there will be only one bill,” Gatto said.